Trip to the Algonquin Radio Observatory to track GPS Satellites! The task sounded simple enough: develop software to be used to direct an antenna, specifically the Algonquin Radio Observatory, in tracking a GPS satellite. Observe the radio frequency sent by said satellite to confirm successful tracking. Well, however easy or difficult the task sounds to you, I can assure you that it was quite a lot of work. A little while ago, I wrote a post about turning 25. However, due to being so busy, I wasn't able to have my birthday party until last night. It may not sound like a big deal, but having to wait almost 3 weeks to celebrate with my friends, well that was both a first, and a sad part of my busy life. However, I am almost done for this school year, and last night's party was a fantastic success! As I look around my apartment, noting how messy, disorganized, and fun the place looks, I think back to last night. Some friends stayed over and offered to help me start setting up before noon yesterday. I had looked through all my photos, every photo I took, or had taken, of me and my friends over the past 6 years and had 200 of my favourite printed. Some more friends from down the street came over and helped with putting those up as well as helping me blow up balloons and put up streamers. It's been years since I've had balloons at my birthday, it's a little thing, but it made me happy! Chips, pop, juice, fruit, cake and cake, and friends, and sushi, and chicken wings, food was everywhere, as abundant and welcome as my friends. I had 3 Skype calls which I had been very excited for and were very special to me. The first was from a dear friend overseas, working on her graduate studies in Environmental Archaeology at Oxford (I know, awesome right?). We've drifted apart both literally and figuratively, and I was very happy we could share some time together. The second call was from another dear and not so near friend of mine, working on becoming a lawyer at the University of Alberta (I know, I have ambitious friends). Since she moved out west, we've actually become closer friends, and I was very happy that she could take some time out of her studies, and in between exams, to say hello. The third was from my immediate family, not studying for anything, haha, but still ambitious in their own right. My family didn't call me until later in the evening, and I must point out to them now how much I missed them. I lead a busy life, and unfortunately, less connected to them than in the past. Sometimes, I wonder if they think I've forgotten about them. The truth is, sometimes I get so wrapped up in things that it's not that I've forgotten about anyone, it's that I've had to set them aside for the moment, to get things done. Anyway, all three calls were very special to me and that's why they get their own paragraph, and I hope you distant people know how much you mean to me. Also, it was nice showing them around the party. I mean, the party was for me, but it's also for my friends and family. Not everyone gets a chance to see each other, and I've worked hard to have a reputation over the years for bringing people together. My apartment was full, but in a free to move around kind of way. I had people in the kitchen, living room, dining room (it's all open concept so really it's one big room). I especially enjoyed that no one seemed to feel isolated or introverted. I understand feeling this way, and sometimes at parties, it hits me more than most, but everyone seemed to have a great time, and people who haven't seen each other in quite some time, or maybe even ever before, seemed to be hitting it off. Sometimes, I like to sit back and watch my parties, evaluate them and the level of fun being had. I did this a couple of times last night and it was just really nice to see everyone having fun. Sorry, I am rambling. The reality of it all set in last night, though. I mean, that was the point, but my mood went up and up and up, and then, well, I had trouble holding back tears toward the later part of the evening. Most of my friends had left, but a few remained. My memory board was full of some good times, and silly drawings. It still makes me a little sad to think about it, (but in a good way?). I'm very excited to be taking this next step. I am in need of a change, and with grad school ahead of me, I might not get another chance to be "responsibly irresponsible", as I like to call this. It's not really irresponsible, but I like the idea of just doing what I want, and going where I want, knowing I will be fine either way. Edmonton, my destination of choice, looks to be a fantastic place, full of opportunity and adventure. I am booking a flight today, filling out the paperwork for an apartment today, and hopefully, soon, I will have a decent job locked in and guaranteed. Thankfully, enough, I'm not a person afraid of being alone. Perhaps, it's because I never am. My friends and family are with me, in my thoughts, wherever I go. Perhaps, it's because I have a couple of friends out there, and I look forward to spending some time with them. Mostly, it's because of who I am, and that I finally am getting to know that person. I have always had a sense of doubt, but also a very strong confidence. Since coming to university, I have grown up. I have learned more about myself, and I have had a very amazing time with my friends. I will miss the ease and familiarity of this place, I will miss seeing so many close friends at the drop of a hat, but I look forward to the adventure, and just because I am gone doesn't mean I will lose my friends. I've booked a flight for Edmonton, leaving on the end of May. I look forward to getting myself prepared, and having some more good times with those here in Ontario. Here, I want to thank my friends and family. Each and every person who has been a part of my life has left it better and richer than before. I have been extremely blessed to have had such amazing companionship over the years, and I love you all. To everyone who came to my party, or called, I had the best time. You helped give me exactly what I wanted for my birthday. Like all times before it, and those to come, it was wonderful, beautiful, amazing, and I will hold it in my heart forever. P.S. For anyone who wants any of the photos from that night, or the ones on the wall, let me know, we'll see what we can do. And if anyone who came has any photos to share, please let me know! Once again, thanks, for everything. Hello! It's been a while since I've blogged about my engineering experience, but that's because I've been too busy working to reflect on it. For anyone who talks with me regularly, or reads this blog often, you'll know about this one particular project that I've been working on and just finished. Ladies and gentlemen, the Pathtracker! The Pathtracker is a navigational tool, combining the benefits of a GPS with those of an IMU (inertial measurement unit). The IMU is commonly used in robotics, as it contains accelerometers (like those in your phone to tell when you rotate the screen), and gyroscopes (a tool used for determining rotation) to measure its movement. The purpose of the Pathtracker is to combine these two devices into one mobile platform, which will autonomously plot its movement onto Google Maps. 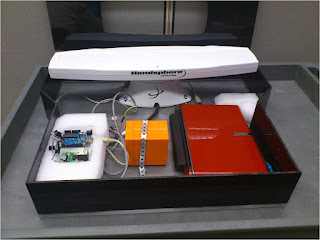 As can be seen above, the mobile unit is a simple plastic enclosure which houses the GPS, IMU, battery, and laptop computer. The dimensions of the enclosure are quite large, 65cm by 54cm by 15 cm, but this was mostly to easily facilitate a student project, and account for the GPS, as it is 60cm long. You might be wondering why the GPS is so large, as the one in your car is much smaller, and the one in your phone is smaller still. Well, first off, our GPS has two antennas, one at each end. Secondly, ours is more accurate than yours. While your phone's GPS has an accuracy of anywhere between 5-50 metres, (and that can be generous), our GPS has an accuracy of less than a metre. Additionally, the reason it's so long is because our GPS takes very accurate heading (directional) measurements, and the length between antennas is vital to giving an accurate heading (less than 0.3° off). Okay, so how does the Pathtracker work? Well, if you haven't already seen it, please watch this little video. We presented that at both the Preliminary Design Review and the Final Demonstration. It was made with the help of my very skilled and excellent friend, Marco Barrettara and does a great job of showing you what our concept is. Basically, the GPS and IMU, encased in the enclosure, are powered up, and start transmitting their information to the laptop. While the GPS tracks the latitude and longitudinal position of the enclosure, the IMU tracks the motion between GPS readings, adding its motion and rotation to that of the GPS. Now, while the IMU is very sensitive, it is susceptible to drift. Basically, over time, the IMU's information becomes unreliable as any errors in the readings accumulate over time as more readings come in. That is where the GPS comes in. The readings from the GPS are used to reset the IMU's information over time. The images below should help illustrate my point. The type of filtering, known as Kalman filtering, basically takes information at specific time steps and tries to find an average of the readings. Without filtering, as seen on the left, the black circles represent the GPS positions, whereas the blue path represents the path the IMU is reading. See how they don't line up? Well, ideally they would, but the IMU drifts over time, as mentioned. Now, the computer filters the information, using the GPS as reliable positions, and ideally the path on the right would be outputted. So, if the GPS is used for reliable positioning, why are we using the IMU? Well, there are several reasons for that. The first is that we might not always have a GPS signal. Sometimes, due to trees, buildings or some other obstruction, one can lose a GPS signal. In that case, the IMU is used to fill in the gap, provided that segment of time is short. A second reason is that the IMU refreshes faster than a GPS, allowing for better positioning for an object moving at high speed and changing directions. A third reason is that we are working toward eliminating the GPS from the system entirely. While extremely accurate, the GPS is dependent on getting a signal, and this requires us to be outside. The concept of interior navigation, while not new, is novel enough to be a field of interest in navigation, and that is what we are working toward. 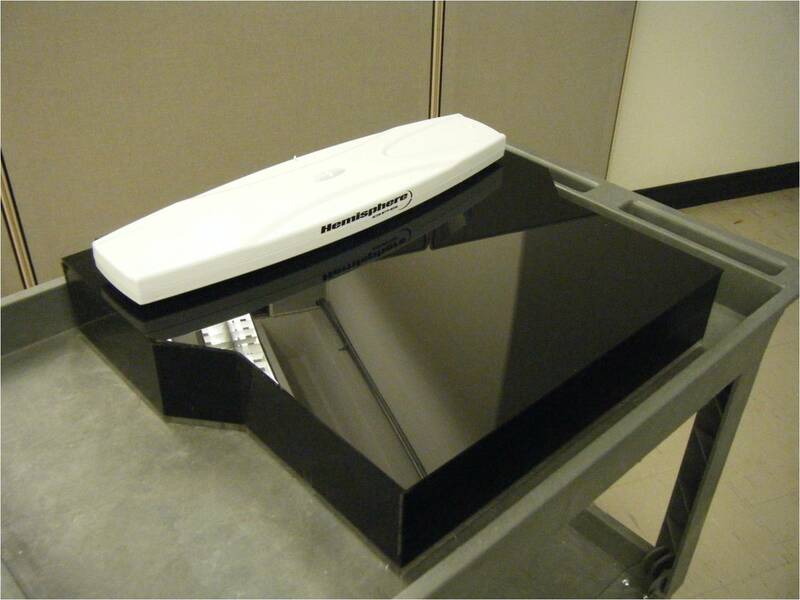 So, after some research into this problem, and discussing it with our professor, our team ordered some hardware. The GPS is a Hemisphere V100, with two antennas and a high accuracy, mentioned earlier. The IMU is from Analog Devices, ADIS16360, and worked very well for this project. Contrary to most pieces of hardware nowadays which are simply plug and play, our hardware required a bit more work and research. None of the members of my team knew anything about working with this hardware, so getting it to work was a considerable challenge. The GPS wasn't too bad, as our professor's graduate student had a similar one, and it involves a serial to USB cable. The IMU, however, took a bit more research. Having a mass of 30 grams, and only a couple of cm long and wide, the IMU, at first, appears to be a simple device. The IMU came with an evaluation board, as seen on the upper left, and this helped interface the IMU with the computer. The information from the IMU corresponded to one set of the 12 pins on the evaluation board. After conferring with my professor, and some more research, I decided to use an Arduino Uno microcontroller to interface the IMU with the computer. Cheap, simple, and with a variety of functionality, Arduino microcontrollers are a big hit in the world of electronics. Additionally, the language used to program them is very similar to C++, a common programming language, and is available for free at the Arduino website. 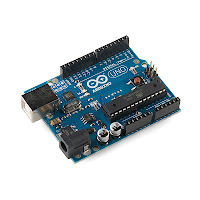 The Arduino's purpose was to program the IMU, in order to access the information I needed, namely the accelerations and rotations in the x, y, and z directions. After referencing the IMU datasheet, I connected wires from the IMU evaluation board to the digital input/output pins, seen as the black holes on the top and bottom right of the above picture. Once there, I needed to connect the Arduino Uno to my computer, and for that, I used a serial to USB cable. The serial to USB cable is one which you all might have in your house; it's the cable which connects a modern laptop with your computer. Once I figured out what I needed, I just pulled the one out of my printer and went to school, feeling like MacGuiver. The next stage took quite a long time and I'm not going to get into the really technical stuff because it might bore you, but basically, I had to program the Arduino to send commands to the IMU, so that the IMU would sent the information I needed to the computer. It took quite a bit of work, but I really learned a lot about hardware, the Arduino software, and had to brush up on my digital logic. Once that was complete, I had to confer with one of my colleagues who was working with the Kalman filtering code. Thankfully, most of the code was written and provided to us by our professor's graduate student. The reason I say thankfully is because while I learned about the inner workings of the code from both this project and my robotics class, it would have taken us way too long to complete and would have been an entire project unto itself. Even though it's the most important piece of software, we still had to make changes to suit our purposes and we went beyond it, hoping to update our data in real-time onto Google Maps. So, my colleague spent most of her time, when she wasn't managing the project and documentation, working with the Kalman filtering software. My other colleague spent most of his time working with Google Maps. Once I had the hardware working, and my first colleague had the filtering software working properly, this colleague had to collect it, organize it, and upload it to Google Maps, in real-time. When I say real-time, I mean to say that the information had to be sent and plotted onto Google Maps, as it was being collected. If you'd like to see some of our testing information, check out this link: Pathtracker. It's still a work in progress, but it will show you some of our testing data as it was registered by our hardware and uploaded to the website. Some of this sounds easy, but it's not as easy as you'd think, especially once you get into it. As I mentioned, none of us had any experience in this beyond the theoretical, so it was really nice gaining this experience. Sure, it caused us to be really stressed and worried about the project, but we learned a lot and it came together toward the end. The only thing I am upset about was the final presentation. There were 4 teams in the class, and at the end of the year, we had a presentation of our projects and the top 3 teams earned a cash prize. Surprisingly, our team earned 4th place. This actually shocked me quite a bit. While I am not going to say that our project was that super amazing, I didn't think we deserved last considering the complexity of our project and how much we accomplished. It wasn't our presentation skills. My team did very well, and with the video from above and some other visuals, we had a very nice looking, and comprehensive presentation. Additionally, I love presentations and fielded questions very well, if I may be allowed to say so myself. But, I think the other projects had pizazz, had more interactivity, which made the judges more inclined to vote for them. They said it was a close competition, but I am still a little disappointed. But, as I said, a lot was learned, and I very proud of the project as a whole. Our team learned a lot, still remained if not friends, than at least stayed on good terms, and the project was completed. I await the final grade, but I expect it to be a good one. For more information, please consult either the BDN Pathtracker website, Pathtracker, or the school website which will host this information for years to come, ENG4000. (Please excuse the simple nature of our website. It was made very much toward the end of the course and was only used as a repository for the information at hand, and the aesthetics were not so important). I am glad to be done. Both this blog post, and the project itself. It has been a long term and I am looking forward to the summer. Stay tuned as I have one more big project to post about. After that, my posts will take on a bit more of a personal, adventurous nature, so I hope you enjoy that! Originally featured on the D4sign D&D design blog. So, I've been thinking about this topic a little bit, and I realized I had more than a little to say on the matter. In this post, I will outline my thoughts on how the size of a party can affect the experience and offer some tips for players and DMs alike for running parties of varying sizes. D&D is a fascinating game for many reasons, but the one thing which makes it so fun, for me, is the interaction of people in entirely new and unexpected ways. The way a group of players interact is just as important, if not more so, than the way the characters mesh together. One factor which can seriously affect this experience is the size of the party and here's how, as outlined in different party sizes. Can you draw? Doodle? Make any kind of graphical sense on paper? If so, and if you're ever looking for things to draw, I've completed a list and I need your help. The thing is, I'm great with words, sometimes too great as I use too many, haha, but I cannot draw. I could probably make a very simple sketch, but it would take me too long, and not look very good at all. So, if you think you can, and if you'd be interested, I have included a list of things from my journals that I would love to see made, even if on the back of a napkin. and edited and posted on my blog, under the label In Search of Fate. But, feel free to experiment, play around, see what you come up with. Remember, I have 0 drawing ability so even your worst is worthy of my attention. If any of these inspire you to draw, well, I'm happy to help, and would love hearing from you and seeing what you come up with! Either way, thanks for reading, more to come in the not so distant future! Originally posted on D4sign, a blog about D&D design, here is my response to metagaming, from a player's perspective. This is in response to Dominic Matte's article on Metagaming, or using knowledge of game mechanics to influence character choices. In this article, I will attempt to give some advice and perspective on what a player should consider involving Metagaming. Today marks the 25th anniversary of my birth! That's a number all right. It's the perfect square of 5 times 5, which is awesome because 5 is my favourite number! Why? I think it started years ago whenever someone would ask me a question involving a number, I would just hold my hand up, then I started saying 5, and well, there you go. Also, my birthday lies on the 5th...hmm, thinking too much about numbers now. Let's get back to that one in particular. A quarter of a century. Sounds pretty important or something when I write it like that. Geologically speaking, it's nothing. Astronomically speaking, even less so. But, to me, it's special. All my birthdays are special. When I was in elementary school, it was the one day a year when I could count on friends being at my house. I lived far from town and it wasn't always easy for people to make the trip. But, my birthdays have always been a great excuse to get everyone out, plus gifts and cake and ice cream! Since I first began university, my social life has pretty much exploded. I went from having some friends at home, guys and gals I liked but only hung out with infrequently, to having friends pretty much live at my house. I've had parties continue for days, and friends as comfortable in my own home as their own. Birthdays are also special for me in the same way that New Year's day is for everyone else. I use them to evaluate myself, how I've been, how I am, and where I'm heading. Without even realizing it, I started having traditions. I wake up, no later than 10:30am, and take the chance to...well, to check myself out. I examine myself physically, and remember doing so the previous birthday. I compare, make sure I know myself as well as I think I do, and take that moment to be me, to be comfortable with how I am today. So, how are things? Pretty well. I have a lot of work to do and will probably spend all of today doing it, having to delay the party until later in the month because I cannot really spare too much time, but still, I'm feeling good. I have a family that loves me, and probably is a little mad at how infrequently I've been talking with them, but I promise, I'm working on it. My family is healthy, and for the most part, happy. My friends are amazing, and again, for the most part, happy (I think). So many people in my life to inspire me and motivate me and keep me company, cook for me, and make me feel special. I'm very fortunate to have such a group of esteemed peers and family members. My birthday is also awesome because it's the one day a year I am perfectly able to be honest with myself. This year, I'm getting two days. Today, and the day of my party, but whatever, I think it's fair. I've been struggling with a lack of self-confidence for a long time. Since coming to university, that problem has become less and less, thanks to those I mentioned above, but it still pervades my psyche sometimes. Thankfully, I have a very honest, and caring support group. I have grown to trust myself and trust my friends and family. If I were even close to doing or saying anything stupid, I trust my brain or my heart to let me know. Even if I were in any doubt, I trust my friends to let me know. Even if they were nice, and I was foolish, I can trust them to still be my friend even after I did that silly thing. Plus, life is an adventure, you might as well take a wrong turn now and then, could be fun! I really wish I were graduating this year. I wish things had worked out that way, but perhaps it was for a good reason. I mean, it does work better for me now, but I do wish to be done this one part of my life completely. Still, I am moving forward, westward at least, and I am looking forward to trying something new. I am not yet ready for Alberta, and to be honest, not sure if it's ready for me. I take and make awesome wherever I go, so that province better saddle up...you know, more than it probably already has, haha. This has been a set of roaming thoughts, and I thank you for being with me, on the journey thus far. I plan to carry you in my thoughts and share all my exciting adventures with you as they develop. Thanks for reading my semi-emotional rambling. To those I know personally, I look forward to seeing you soon. To those who don't, drop me a line, maybe we can be friends.